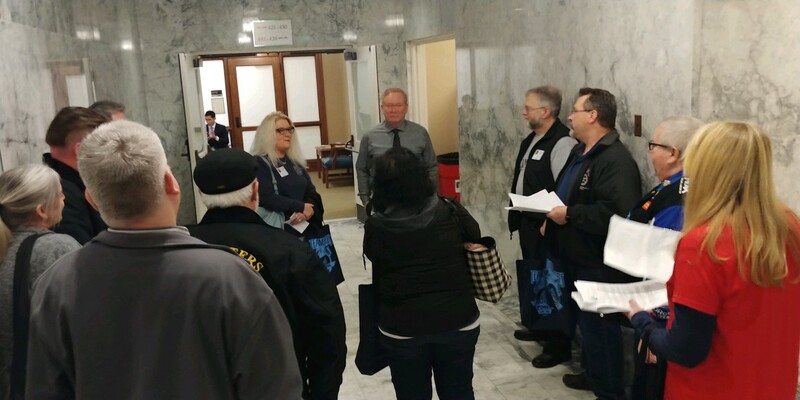 On Monday, February 25th, 2019, 53 Teamsters from your Joint Council 28, including 11 Local 38 Teamsters travelled down to Olympia to speak with and educate our Senators and Representatives about a couple of Bills, Senate Bill 5717 and House Bill 1491 that would have a huge impact on our Retail Workers in Local 38. Like Seattle's Secure Scheduling Initiative that was passed in 2017, it would provide better protections over how Employers write and manage our schedules. Unfortunately, on Friday, March 1st, the deadline to get bills passed out of fiscal committees, it did not pass out of committee. We will continue to work on this legislation in the coming months and years. Your Local #38 Legislative Team is not giving up. We thank all the workers who came down to our State's Capitol! WTLL 2019 LOBBY DAY WAS SO MUCH FUN! We urged Washington state legislators to reform non-competition agreements! Today in Washington state, many people are denied the freedom to work in their chosen professions by pernicious “non-competition agreements.” These contracts, often signed by workers as a condition of their hiring, restrict them from finding better jobs in their industry. SB 5478 and HB 1450 would regulate non-competition covenants in Washington state to ensure they aren’t being used to exploit workers and deny them the opportunities to find better jobs. Both bills have been approved by labor policy committees and are ready for floor votes in the Senate and House. Originally intended to protect a company’s “investment” in executives or highly paid managers who might unfairly take their knowledge to a rival company, non-competition covenants have proliferated in recent years and are now required of many middle-class and low-wage workers. A New York Times expose found they were required in professions “from event planners to chefs to investment fund managers to yoga instructors.” Even fast-food employees.
? Setting a wage threshold — twice the state’s Average Annual Wage, or about $120,000 — below which non-competition covenants would be void and unenforceable.
? Barring non-competition covenants for laid-off employees.
? Limiting the duration of non-competition covenants to 18 months.
? If an employer tries to enforce an overly broad noncompete and the court rewrites it, the ex-employee receives a statutory penalty plus his or her attorney fees.
? Protecting the ability of low-wage workers to hold a second job. The streets of Los Angeles are packed with the sights and sounds of collective action this week. Braving the cold rain, some 30,000 United Teachers Los Angeles (UTLA) members turned out for picket lines across the city yesterday, joined by more than 10,000 parents, students and community members. 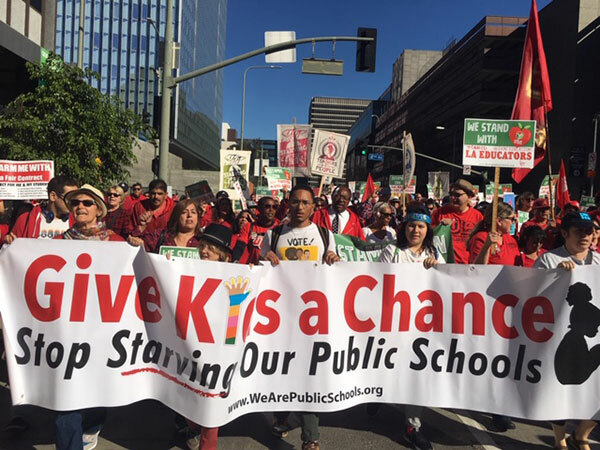 Every LA school site—more than 900—participated in the strike, culminating in a 50,000-person march to the Los Angeles Unified School District’s (LAUSD’s) headquarters. $20,000: Striking teachers’ demand for per-pupil school funding in Los Angeles. The first filing deadline for a 2019 gubernatorial election is just weeks away (we see you, Kentucky). What better time than now to provide a preview of the three states where voters will elect a governor this year. Kentucky, Louisiana, and Mississippi are the only states holding regularly scheduled elections for state executive positions in 2019. All three states will vote for governor and lieutenant governor, along with attorney general, secretary of state, agriculture commissioner, and treasurer offices. Other state executive positions up for election include auditor in Kentucky and Mississippi, insurance commissioner in Louisiana and Mississippi, and public service commissioner in Mississippi. In total, 23 executive positions are on the ballot. There were 303 state executive seats up for election across 43 states in 2018. Two of the sitting governors, Matt Bevin (R) in Kentucky and John Bel Edwards (D) in Louisiana, are completing their first terms. Bevin announced in August 2018 that he plans to run for re-election. Edwards is seeking a second term. In Mississippi, Gov. Phil Bryant (R) was first elected in 2011 and re-elected in 2015. He is ineligible to run for re-election due to term limits. Kentucky and Mississippi are currently Republican trifectas. Louisiana is a divided government - both chambers of the legislature have Republican majorities. Following the 2018 election, there are 27 Republican governors and 23 Democratic governors across the United States. There were 36 governorships on the ballot in 2018, and there are another 11 up for election in 2020. Of the 14 governor's offices up for election across 2019 and 2020, nine are currently held by Republicans. Only one of those 14 elections have received a toss-up rating from Sabato's Crystal Ball, however, and that is the Montana seat currently held by term-limited Gov. Steve Bullock (D) and up for election in 2020. The Cook Political Report did not identify any of the races as a toss-up; they rated the Montana race as Leans Democratic as of January 9, 2019. The 2019 state executive filing deadlines are January 29 in Kentucky, March 1 in Mississippi, and August 8 in Louisiana. The primaries are on May 21 in Kentucky, August 6 in Mississippi, and October 12 in Louisiana. Mississippi will hold primary runoffs on August 27 if no primary candidate receives a simple majority of the vote. General elections will occur on November 5 in Kentucky and Mississippi and November 16 in Louisiana. Canadians are apparently sick of competing with nonunionized foreign workers South of the border. According to the Globe & Mail, the country’s negotiating team is asking the United States to scrap its anti-union right-to-work laws as part of an updated North American Free Trade Agreement, presumably in order to prevent poorly paid Americans from undercutting organized Canadian labor on wages. Obviously, this is not what the Trump administration had in mind when it demanded our neighbors return to NAFTA’s negotiating table. Right-to-work statutes allow employees to opt out of paying fees to the unions that represent them in collective bargaining. These laws are frequently blamed for draining organized labor of financial resources and have likely contributed to the decline of union organizing over the past several decades. States are permitted to enact the laws under the Taft-Hartley Act of 1947, a landmark piece of union-busting legislation that congressional Republicans passed over President Harry Truman’s veto. 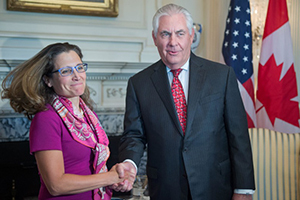 Canada, which like the U.S. is seeking to strengthen NAFTA’s labor protections overall, would reportedly appreciate it if Washington would pass new federal legislation banning right-to-work provisions. To be clear, there is zero chance that a Republican White House would agree to do away with right-to-work laws as part of a trade deal. Breaking the power of organized labor is a key piece of the party’s long-term agenda, and relinquishing that goal in order to appease our lefty neighbors would cause an uproar among the GOP donor class. Canada almost surely knows this, and is staking out an extreme negotiating position in order to signal that it’s treating these talks seriously and is prepared to ask for major concessions. It’s also an ironic way to throw the Trump administration’s protectionist rhetoric back in its face, which seems like part of the point. Our president of course loves to complain about cheap foreign labor undercutting American factory workers. And now and then, he has a point. Mexico, for instance, more or less lacks independent labor unions, and partly as a result, wages there have barely risen over the past 15 years, even as auto manufacturing has flourished within the country’s industrializing north. For this reason, the fact that the original NAFTA lacked basic, enforceable labor standards cutting across the U.S., Canada, and Mexico is widely looked at as a mistake, which both the Trump administration and Canada are looking to rectify in the current renegotiations. The Trump administration’s official NAFTA wish list includes enshrining the “Freedom of association and the effective recognition of the right to collective bargaining” among all three countries. But Canada’s right-to-work jab is a reminder that, for all our talk of raising the rest of the world to our own labor standards, America’s record on workers’ rights isn’t exactly pristine, and that much of the developed world may see a nonunion factory in Alabama much the way we see car plants in San Luis Potosi. In other words, we’re not always the ones being taken advantage of. It turns out, not surprisingly, that the "right to work" advocates want to obstruct yet another democratic right of workers in Missouri. "Supporters of Missouri’s new 'right to work' law have filed another lawsuit seeking to scuttle an attempt by labor officials to put the issue before voters for an up-or-down vote. In a suit filed Friday in Cole County, attorneys representing two Kansas City police officers and a nurse from Liberty allege that wording for a proposed ballot initiative is riddled with “embarrassing” grammatical errors and is therefore unfair. The lawsuit is seeking that the summary statement approved last month by Republican Secretary of State Jay Ashcroft be replaced. 'The summary statement should accurately reflect both the legal and probable effects of the proposed initiative and be fair and impartial so that the voters are not deceived or mislead,' the lawsuit notes. In a statement, Ashcroft defended the petition, saying his office has provided voters with clear, concise and complete language. 'I am saddened that some are playing politics with the right of the people to exercise their constitutional right, and I am confident the court will quickly and correctly let the will of the people decide this issue,' Ashcroft said. The legal action represents another attempt to stymie labor officials, who want to give voters the chance to weigh in on the issue after it was pushed quickly through the GOP-controlled Legislature this year and signed into law by Republican Gov. Eric Greitens." This Summer your Local #38 Legislative Team, made up of Members just like you, from UPS, Safeway, Haggen, McKesson Drug, and QFC, helped in the endorsement process by holding several COPE (Committee On Political Education) interviews with many local candidates running for office. Those meetings have been held downstairs at our Local from June through August and a big THANK YOU goes out to Jovan Stoddard, Michelle Mulch, Dennis Knapp, Patti Roodzant, Mike Raughter, Secretary-Treasurer Steve Chandler, Daryn Wilbur, Jake Cohen, Nathan Yaffee, and Debbie Gath for hearing those candidates sound off on how they would support labor-related issues, should they be elected. These Members, along with other Members and Employees from other Teamster Locals around our state, have the final say in whether or not the Teamsters endorse these officials when running for office. Snohomish County Executive, Snohomish County Council, Mayors of Lake Stevens and Marysville, Port of Seattle Council positions, and City Council positions for Kent, Edmonds, Marysville, Shoreline, Lake Stevens, Edmonds, and Everett. If any of you have interest in hearing, first hand, what the elected officials running for office, have to bring to Labor, or want to take part in the interview process of who the Teamsters endorse, or in future phone-banking for candidates, or Lobbying in Olympia after the New Year, we encourage you to call Debbie Gath to join our Legislative Team at Local #38! We make politics fun!! On Wednesday, the US Senate took a final vote approving Fast Track Authority for future trade deals, including the Trans-Pacific Partnership (TPP). On Thursday, the House approved Trade Adjustment Assistance for workers displaced as a direct result of free trade, attached to the African Growth and Opportunity Act. The TAA bill that was passed is still an exclusionary bill funded through $700 million in cuts to Medicare. As of now, TPP negotiations are still ongoing. When the trade deal is introduced in Congress, there will be a vote before the agreement is implemented. Moving forward, the goal is to make sure that this job-killing trade deal does not make it through Congress and to the President’s desk. This will require the same dedication that it took for all of us to derail two separate trade votes in the span of two months. Thank you for your work so far, and we still have further to go. Don't let Fast Track passing get you down. We can still stop the Trans-Pacific Partnership. We can make sure that the biggest corporate power grab in history gets derailed. It’s not going to be easy, but we’ve done impressive things before. Against all odds, we overcame the powerful telecom lobby to stop the development of an “internet slow lane” for those who couldn’t pay. We convinced a major Canadian coffee company to dump its partnership with one of the most powerful oil companies in the world. We got nearly every major palm oil manufacturer and purchaser to commit to stop deforestation and human rights abuses. And there's so much more we've done together. What unites these victories is that we were the underdog and we still won, because we joined together to fight back against corporate power. For today, let’s mourn together. Let’s get angry together. And tomorrow let’s get right back in there and stop. this. deal. On May 21st and 22nd, Tammi Brady and Debbie Gath took our favorite D.R.I.V.E. Representative, Kevin Currie, out to visit some of our grocery stores and explain what D.R.I.V.E. stands for and how important it is to contribute to this fund, especially with Washington State being on the radar for being considered one of the next state to become a Right To Work FOR LESS, state!! After our store visits, we had our 2nd annual End Of Summer BBQ in the Local #38 parking lot, prior to our May General Meeting. The weather was fabulous! Kevin Currie was our BBQ Chef for the evening! Are you a Republican? A Democrat? We don't care! If you are a Teamster we want YOU to run for local office. We need the strong work ethic, drive to do good for your community, passion, responsibility, and integrity that solid American Labor Union folk have. School Board? County Commissioner? City Council? We will support you, train you, back you all the way. Contact us with any questions. WE WANT YOU! MARCH 25TH, 2015 TEAMSTERS LOBBY DAY! 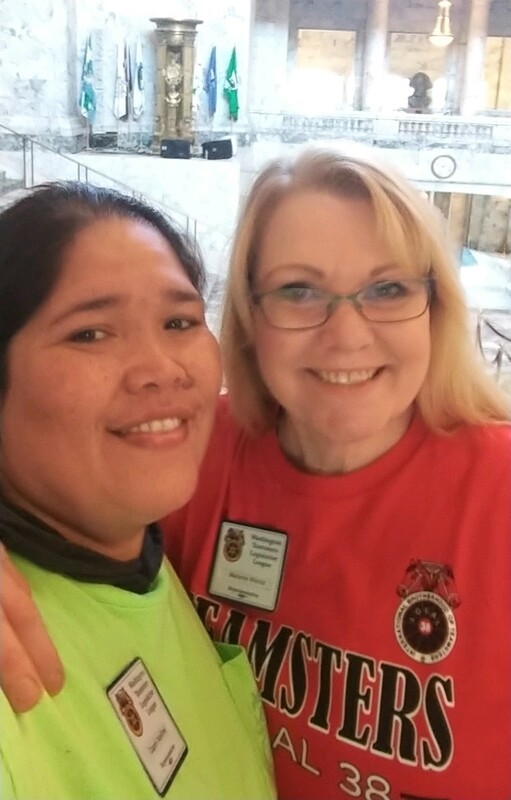 It was a blustery Spring day at the State Capitol, when 60+ Teamsters took to the halls of Floor 3 of the Legislative Building, AKA "The Dome", for Teamster Lobby Day! 18 of those Teamsters came from your very own Local #38! We started the day with a short condensed course of "Lobby 101" at the Washington State Labor Council. The Leg Building houses the chambers of the Washington State Legislature and offices of several elected officials. This building is the most prominent feature of the capitol grounds. It's dome is 287 feet high, making it the tallest self-supportive masonry dome in the United States and the fourth tallest in the world. A number of features in the structure commemorating Washington's addition to the Union as the 42nd state - 42 steps lead to the buildin'gs North entrance and one of the four 42-star flags owned by the state is displayed in the State Reception Room. Flags with this number of stars were never official because of the admission of Idaho shortly after Washington. We spent two hours watching the House Representatives and Senators from above, as they listened to and voted on bills, and pulling our Senators off the floor to voice our Teamster related concerns. Some Senators, like Senator Steve Conway from John Howell, Jr.'s 29th District, met us with exuberance! And then others, like Senator Steve Hobbs from Jovan Stoddard's 44th District, left us feeling under-whelmed as we asked him about House Bills 1355 and 1356. All in all, Local 38 met with 5 Senators and House Representative Mike Sells that day to discuss HB1355 ~ An act relating to increasing the minimum hourly wage to twelve dollars over four years, without creating new exemptions, and HB1356 ~ Which would require employers with more than four full-time employees to provide paid leave to employees for specified medical reasons or closure of the employee's place of business or child's school. It really was a fun time! I hope some of you will join us next year for Teamster Lobby Day 2016! On March 6th, 5 Teamsters descended on this Capitol Dome to put pressure on our Legislators in Session. 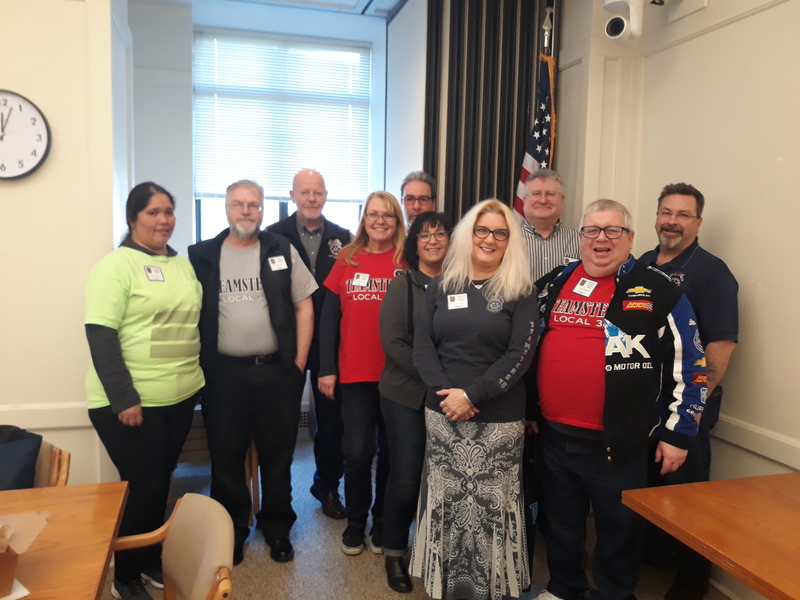 Heather Ewing, from Local 231, and President John Howell, Jr., Vice President Mike Raughter, and Political Coordinator, Debbie Gath from your Local #38 had an agenda and the day proved to be very productive! House Bill 1595 has been a very important bill that affects our Teamster Truck Drivers on prevailing wage job sites. House Representative, Tana Senn, from the 41st District (Mercer Island/Bellevue) was one of the prime sponsors of the bill. While Lily, Debbie, John, Mike, and Heather prepared for how we were going to put pressure on the Republicans in the House, Heather and Mike watched the in-house monitor as the bill passed, by an overwhelming vote of 97 to 1! This was so exciting, we sent a message into Chambers, thanking Representative Senn, and she came out in the halls to celebrate with us. The reason we have apprenticeship standards is to ensure that we have a highly skilled and readily available workforce for public works construction projects. Apprenticeship programs also create important opportunities for young people and returning veterans. Because we have a rapidly aging workfource in the building and construction trades, apprenticeship standards are also critical to ensuring workforce stability. WSDOT recently ruled that truck driver apprentice hours should only be reported if the apprentice spends two or more hours on the project site. Because of this narrow interpretation of apprenticeship standards, Teamster truck drivers would not accrue apprenticeship hours at the same rate as other construction workers, simply because they frequently leave the job site to transport the materials. Other construction statues, such as the prevailing wage law, apply to workers who are "employed upon" the project. If workers are paid the prevailing wage rate whether they are physically working on the job site or employed on the project trucking materials back and forth, why wouldn't the same standard apply to apprenticeship hours? WSDOT has had no problem meeting this intent and applying the apprentice utilization requirements to other trades working on public works projects. For all other trades, including trades that come and go from the actual work site throughout the day, WSDOT counts every hour that an apprentice works on the project without regard to whether the apprentice is physically ON-SITE for a majority of the shift. WSDOT has applied a different standard, however, to truck drivers, which is both discriminatory and contrary to the legislature's expressed intent. Under the statue defining apprenticeship labor hours, simply change the requirements for accrual of apprenticeship hours from being employed "on the site of a public works project" to being employed "upon the public works project". Changing just a few words in the existing law, was all we were asking. Your Teamster Lobbyists asked for weeks, as we met Representatives and Senators from all over the state. Our efforts proved worth it when it passed the House Floor on March 6th! 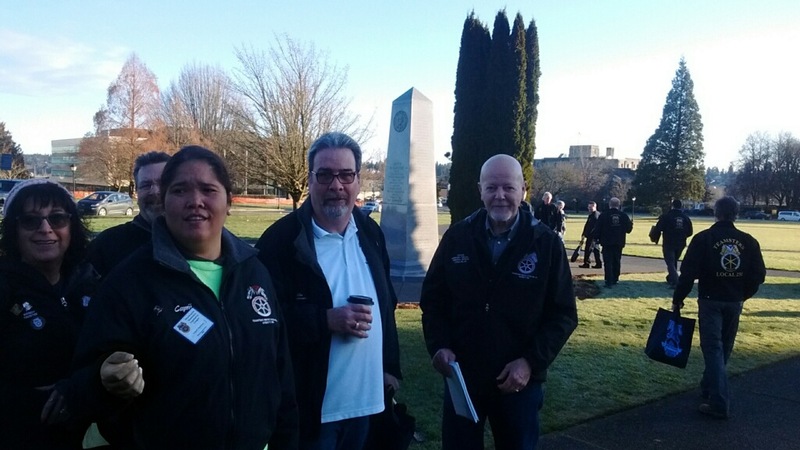 Debbie Gath, Business Agent and Political Coordinator for Local #38 and President, John Howell, Jr. and Vice President, Mike Raughter (Executive Board Members of Local #38) will be headed to Olympia once a month during the long 2015 Legislative Session at our State Capitol to lobby on behalf of Labor, Working Families, and the Teamsters. Check back to this page of your website, to hear an update of what happened during the visits this year. On a very blustery February 6th, Debbie Gath, John Howell, Jr., and Mike Raughter were at the State Capitol with Lily Wilson-Codega, Political Coordinator for Joint Council 28, with back to back appointments with Senators and Representatives. We had about 10-20 minutes with each one, to discuss our points about certain Senate Bills and House Bills that are currently up for discussion and possible passing through the various steps. These Bills affect working families, labor, and our Members. Amongst other things talked about, we discussed HB 1343/SB 5301, known to some as the "Costco Liquor Bill" or this year, the "Restaurant Association's Liquor Bill". It directly co-relates with Initiative 1183, the ballot measure that passed, and that Costco spent tens of millions of dollars on in 2011. The bill, that the Teamsters opposes, would eliminate the 17% fee Costco and other retailers currently pay on liquor sales to bars and restaurants. This would move Washington to a retail sales model that partially exists in only three other states, including Alaska. This bill effects our Crown Distributing Members and all of our Retail Members. Another bill that we spent much time talking about was HB 1595, known to some as the "Apprenticeship Utilization Bill". Apprenticeship utilization requirements are intended to ensure that we have a highly skilled and available workforce for public works construction projects. WSDOT recently ruled that truck driver apprentice hours should only be reported if the apprentice spends two or more hours on the project site. Because of this narrow interpretation of apprenticeship standards, Teamster truck drivers would not accrue apprenticeship hours at the same rate as other construction workers, simply because they frequently leave the job site to transport materials. http://app.leg.wa.gov/billinfo/summary.aspx?bill=1595&year=2015 or go to the Driver and Construction Trades section of this website.